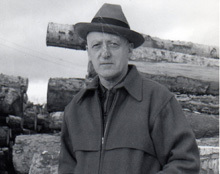 White Mountain Lumber was started in 1945 when Emmet J. Kelley (shown at left) and Arthur Napert joined forces and purchased the assets of a bankrupt sawmill. They built a successful lumber business and remained partners until 1971, when Arthur retired. At 70 years old, Emmet, too, thought it might be time to retire. His son, Barry, a recent graduate of Colby College with a short stint teaching high school English, came in to help liquidate the assets. The mill was still running and soon Barry found his interest in the sawmill business growing. He convinced Emmet it was too early for retirement, and together they began new investments in the mill. Emmet took ill in late 1975, and after working together for four years, Barry was left to run the mill after Emmet passed away. From 1975 to 1985 the mill grew as did the pallet business. In addition, the assets of a grade stake business just down the road came up for auction, and White Mountain Lumber entered the grade stake and hub business. Changes in the local market place saw an opportunity to enter the retail building materials business. Mark, who had graduated from St. Michael's College in 1974 and had been in marketing for 10 years in Boston, returned to Berlin with his new family to join Barry in the retail expansion. Over the next 25 years, they built a new retail store, joined the ACE Hardware family, and built one of the largest drive-through lumber yards in the state. Today the sawmill has customers in Maine, New Hampshire, Vermont, Massachusetts and Rhode Island; and the retail operation caters to customers in Coos, Grafton and Carroll counties of New Hampshire.